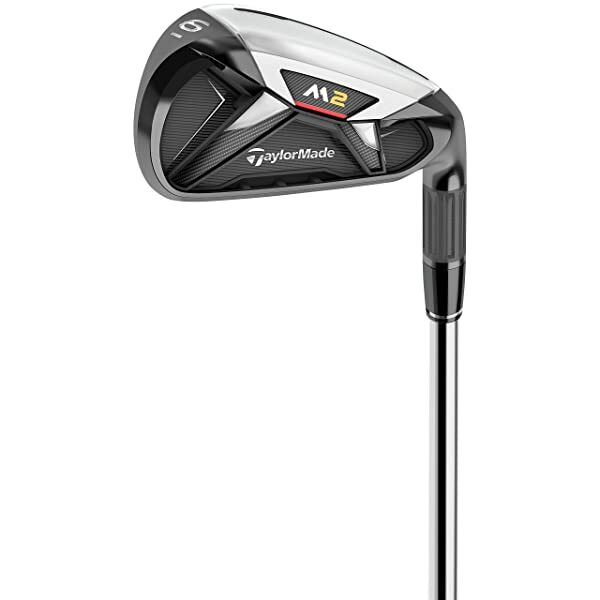 The M2 Men's Iron Set shows why Taylormade is one of the most reputable and trusted names in the golf equipment industry. It is a complete set of Irons that offers players both playability and maximum distance. The forgiveness, feel, and accuracy that the irons give you will leave you a happy golfer, and you will want to swing them every other weekend. The M2 Men’s Iron Set shows why Taylormade is one of the most reputable and trusted names in the golf equipment industry. It is a complete set of Irons that offers players both playability and maximum distance. The forgiveness, feel, and accuracy that the irons give you will leave you a happy golfer, and you will want to swing them every other weekend. These irons also use some modern technologies that include Fluted Hosel, Speed Pocket, 360 Degree Undercut, and 3-D Badge System. The advanced technologies combine to give you some impressive clubs. Fluted Hosel: The thick-thin Fluted Hosel technology removes an impressive three grams of the extra mass trapped in the Hosel. This weight is then spread out throughout the clubhead to give the Iron a low center of gravity. Lowering the center of gravity also promotes higher launch and is useful in increasing the speed of the ball. Speed Pocket: Speed Pocket technology or feature gives the club a thinner sole and this, in turn, increases flexibility, preserves the speed of the ball and also increases the launch angle. This technology is also effective in improving forgiveness for any shots below the center of the face. 360 Degree Undercut: The impressive ball speeds that you get across the face of these irons are to a great extent as a result of the 360-degree undercut. This technology also helps in the creation of the ultra-lower center of gravity by removing some weight from the Topline. Thin Face/Inverted Cone Tech: The flat face on these irons that has Inverted Cone Technology works with the Speed Pocket to produce consistent ball speeds across the club face. 3-D Badge System: These Irons have a light and stiff 3-D badge that is what manages the sound that it makes on impact. Apart from this, the 3-D Badge is also useful for eliminating any unwanted vibrations to give the club a superior feel. The design of these Irons makes them some of the most forgiving and accurate on the market. It is a complete set that includes long irons that you can use in place of hybrids and some very useful wedges. All the clubs have a great feel and golfers will enjoy swinging them. They have a large sweet spot that is easy to locate even for beginners. Everything from the shaft to club head materials is high quality and durable. The Irons make an excellent high-pitched sound during impact. Every iron in this set will give you an effective feedback on both pure and miss-hits. M2 Irons have some comfortable grips. The Irons are light and easy to swing, and so they will not hurt your wrist. The clubs are thicker than most others. Some golfers do not like their appearance as they find them a little dull. The multi-material design looks quite busy, and some pro golfers will not like it. It is quite an expensive set, and this is a significant drawback for many golfers. These irons do not make it easy to tell whether the impressive distances come from the stronger loft or technology. They will not work for golfers that do not like long clubs as they are longer than standard irons. The M2 Irons are among the longest on the market, but this is what most golfers seem to love about them. Just like any other club set from TaylorMade they are a product of some advanced technologies and years of research. Their forgiveness and accuracy are their strongest point, and it is what the manufacturer uses to market them. This set is complete, and it has all the irons and wedges that a golfer can ever need when on the course, and this is regardless of whether he is a pro or a beginner. Although numerous things will make a golfer happy when using these Irons, the sharp look and premium sound and feel are what will make most look forward to swinging them. Other positive things such as the large sweet spot and the high-quality and durable material will also make golfers happy. But, it is important also to note that the Irons are thicker than most others and some golfers also complain that they look too busy. However, there is nothing that can change the fact that it is a top notch set that every mid to high handicapper should try out.